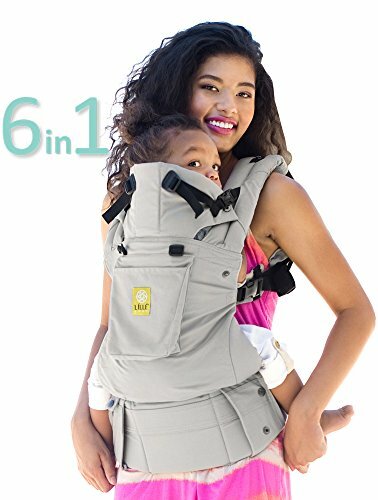 This top-rated baby carrier includes EVERYTHING: six ways to carry your baby, unique lumbar support, headrest, sleeping hood for support & sun protection (UPF 50+), zippered pocket, dual adjustable straps for easier breastfeeding, generous padding and more. Safe for baby’s hips, and acknowledged as a HIP HEALTHY carrier by the International Hip Dysplasia Institute. Adjustable seat and leg openings facilitates proper hip support, frog-leg seating, and curved C-spine position. Adjustable back panel grows with your child and provides support for baby’s neck and head. Endlessly adjustable straps and waist belt for a completely customized fit form petite to tall parents, and makes for an exceptionally comfortable child carrier. Straps have dual adjustments and allows for both H-style or X-style. Timeless and crafted with durable 100% cotton fabric in a variety of classic solids and charming prints. Winner of “Most Comfortable Carrier” by prestigious Cribsie Awards. Luxury, functionality, and style, this is babywearing at its best!